Discover our _count_ native integrations. For niche tools or in-house CRM. And it’s free! Have a question regarding an integration? Let’s talk! The Black Friday shopping day is fast approaching. It is the biggest shopping day of the year. According to research, since 2007, Black Friday revenue generated has increased by 341.95%, hitting $2.36 billion in 2017. In fact, 30 percent of annual retails sales occur between Black Friday and Christmas. This is the best time to create converting Black Friday ads that will bring more leads and sales for your business. The truth is, you have only 24 hours to get the best out of your Black Friday ads. So, creating the best converting Black Friday ads is very important. Consumers are looking for the best Black Friday deals and they search for Black Friday ads to get the deal they want. According to thinkwithgoogle, mobile searches containing “Black Friday” increased by 80% over the past two years. Therefore, you need a solid strategy that will help you to create a converting Black Friday ads for your business and that is what you will learn in this article. The first Black Friday ads creation idea that will help you get more sales is to increase your ad budget. This is because there will be a lot of search for products and services on Black Friday. It can go up as high as 10x more. So, plan to add more money to your Black Friday ads campaign so it will be sufficient where there is a spike in your traffic. If your Black Friday deals are attracting lots of traffic that are converting to sales, you wouldn’t want the Black Friday ads to stop because of an insufficient budget. Likewise, your bid scheduling is also very important. You need to strategically position your Black Friday ads bid within the hours of the day and then lower your bids after the peak period. Below is the Black Friday hourly sales graph put together by Adobe. It will help you know the peak period for your Black Friday ads campaign so you can plan to win. The second Black Friday ads creation idea is to use relevant ad copy. This is very important. Although, Black Friday ads copy is similar to other campaign copy, there are elements of tweaking that will enable you to get more sales. Your Black Friday ads copy should reflect the holiday search terms and deals details that will help you attract relevant traffic to your website. There are phrases that have been proven to convert well during the Black Friday shopping trend. According to a research carried out by Adthena, close to the Black Friday 2017, it was discovered that deal related ad copy that has the word “save“ top the list with 18.79% of impressions on the desktop and over a quarter (27.47%) on the mobile. The second word “% off“ is the second best word for Black Friday ads campaign with 10.03% of impressions. The next word is “discount“ with 9.03% impressions. This is closely followed by “sale“ with 5.6% impressions. According to the analysis above, the words Save, % off, Discount and sale are the winners. Adding one or two of these words to your Black Friday ads campaign can make all the difference in creating a winning Black Friday ads campaign for the forthcoming Black Friday shopping. Also, your Black Friday ads must be relevant to the product you are offering. Don’t create ads about Laptop computers and you are selling computer furniture. The third Black Friday ads creation idea is to “add brand plus to your Black Friday ads campaign” countdown to your ads. 3.Black Friday ads: Add “brand plus” to your Black Friday ads campaign. The third Black Friday ads creation idea is to add “brand plus” to your Black Friday ads campaign. Keywords with your brand name get high CTRS, get lower CPC and generate higher ROI. The brand plus keywords are keywords that contain your brand and the product or category name. For instance, if you sell Dell laptop computers. Instead of using the keyword “laptop computer” which is too generic, you can use “Dell laptop”. It is a brand name plus the product name. When creating your Black Friday ads search and display ads, use your brand keywords plus the product name. Go through your keywords and pay special attention to keywords with brand plus. Check out an example below. Sony is the brand name while Televisions is the product name. As you use brand plus keywords, don’t forget to also add holiday-specific keywords. This includes adding “black Friday” to your Black Friday ads campaign. See a good example from Dell below. The fourth Black Friday ads creation idea is “Add a countdown to your ads”. 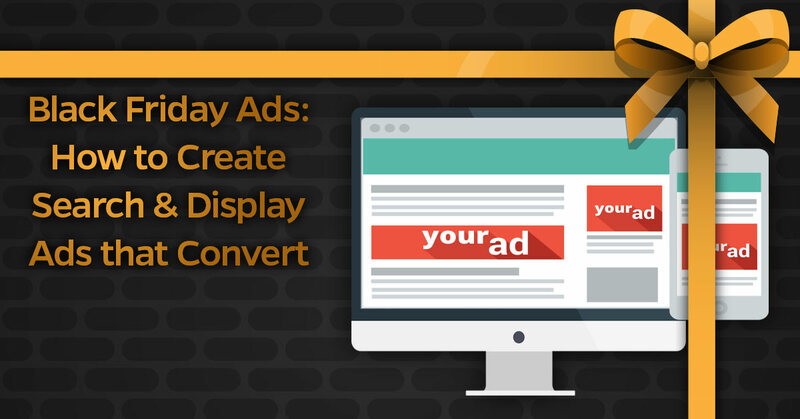 The fourth Black Friday ads creation idea is to add a countdown to your ads campaigns. This is a great strategy because it uses the FOMO strategy. (i.e. Fear of missing out). No one will want to miss out on a great deal that will close in a few hours. It is very effective during the Black Friday shopping. This means that running a specific promotion on Black Friday is very profitable. You can add a countdown timer with one of your Black Friday ads campaigns during the day while you reduce the discount at night as the day wears off. You get more conversions as the countdown comes to an end as people will desire to get the deal before it ends. The fifth Black Friday ads creation idea is “Use specific, high-demand and product sitelinks in your Black Friday ads campaign. The fifth Black Friday ads is to use specific, high-demand product sitelinks in your Black Friday ads. This will help you get more exposures for your product. One way you can do it is to add the products you run promotions for in your sitelinks. For instance, if you are running a Black Friday ads for High heel shoes, it will be great to add category links or product links specific to high heel shoes. Nordstron did a great job in the ad below. They added sitelinks of similar specific and high demand products to the Black Friday ads as seen below. The reasons this works is because during Black Friday, people are in the mood of buying and you don’t need much convincing to get them to buy what they don’t really plan to buy. Just because someone searched for high heel shoes doesn’t mean they won’t be interested in other brands of shoes such as Wedges, Boots, and Sneakers. LeadsBridge already helped more then 10k SMB and enterprises in collecting over 25 million leads. Get your hands on the Black Book of Lead Generation and learn 10 astonishing strategies that we have successfully tested and implemented. Black Friday is an international shopping day where marketers experience massive sales. You don’t want to miss out on it. This is the reason you need to create converting Black Friday ads campaign for your products and services. The five ideas enumerated above will help you get the best out of your Black Friday ads campaign. Have you tried any of the ideas before? If you have, we will like to hear your thoughts in the comment section. Let me ask to you a final question: are you using Facebook Lead Ads feature for your advertising campaign? If so, don’t miss our dedicated Facebook Leads Ads sync tool! Eager digital marketer, nurtured by news and strategies of this world, helping people and businesses to build and reinvent their online presence. Better tracking, better conversions, better audiences, better results. See with your own eyes how LeadsBridge is transforming thousands of businesses around the World in unstoppable lead generation machines. Book a demo with one of our Lead Gen experts today!